An Excel spreadsheet based written by Ken Gregory is now available which calculates the radiation flux based on the original model. The spreadsheet is easy to understand and can be downloaded here. Meanwhile I have been working to handle properly the temperature dependence of barometric pressure and that fraction of the CO2 absorption band within the Black Body spectrum. The new source code is for this is available here. 1. If the lapse rate were zero then there could be no greenhouse effect, even if the atmosphere was 100% CO2. 2. An atmosphere without greenhouse gases (only N2,O2) would radiate directly to space from the surface. The surface temperature would then be 255K and any lapse rate would fall with height from that value. 3. Could there be any lapse rate without greenhouse gases? It has been argued that if radiation cannot cool the top of the atmosphere to space then there can be no temperature gradient. So a simple 1-d atmospheric model with a fixed surface temperature and without greenhouse gases results in an isothermal atmosphere , and no convection. However the real world is 3-D with differential equatorial solar heating with multiple seasonal and diurnal variations. This surely must result in Hadley convection cells transporting heat from the equators to the poles. I am sure that some lapse rate would still exist even without a radiating atmosphere. Updated Model: For the updated Model I have made two improvement to better quantify the radiation model. 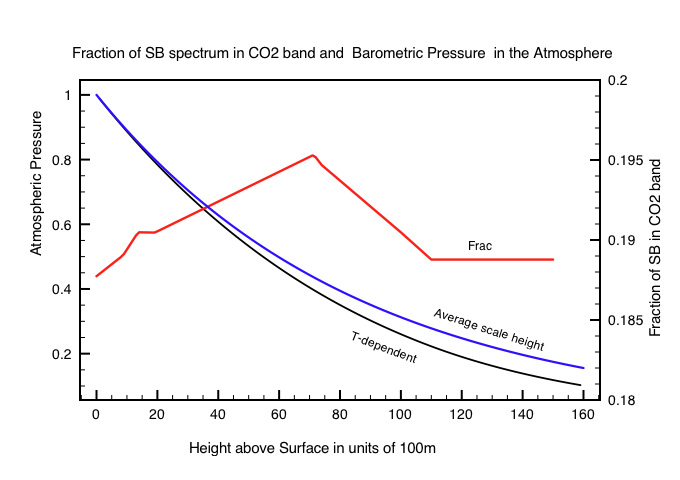 Firstly, I have properly calculated Frac – the fraction of the BB spectrum falling within the CO2 band. To do this I used Wien’s displacement law which states that the basic shape of the SB spectrum is the same at any temperature but is displaced by wavelength. Since temperature falls with height, I used the Wien percentile table giving the product of wavelength*T in order to determine Frac as a function of height in the atmosphere. This is shown in figure 1.
Corrections to the barometric pressure profile and FRAC – the fraction of the total IR spectrum energy lying in the CO2 band 13-17 microns. This band corresponds to the Beers-Lambert absorption data used in the calculation. The second improvement is to use the temperature dependence of the Barometric pressure equation rather than a single scale height. i.e. P =P0*exp(mgz/kT) which changes the pressure profile with height slightly. This changes the partial pressure of CO2 used in the flux calculation. The comparison of both changes are shown in figure 1. 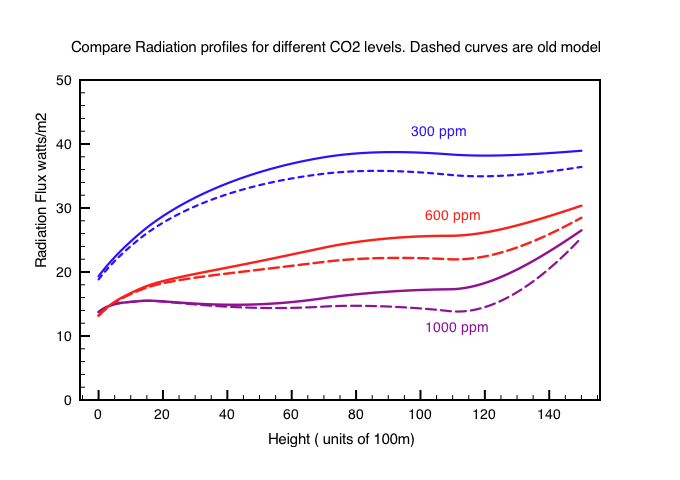 The resultant profiles for up-going radiation in the CO2 absorption band after implementing these changes is shown in figure 3 and compared to the simple model results. Result: The shapes of radiation flow are now steeper in the upper atmosphere. However the overall forcing on the surface temperature to offset the fall in outgoing radiation is about the same ~ 1.1 deg.C (ground) 1.5 deg.C (TOA). So the simple model still gives a good approximation ! This entry was posted in AGW, Climate Change, climate science, Physics, Science and tagged CO2, greenhouse, Models. Bookmark the permalink. I was wandering around through your various greenhouse-ration posts, and finally arrived here and took a peek at your source code, linked-to in this post. In your comments there you state: “Each layer then emits IR in the same band according to Kirchoff law”. However, Kirchhoff’s law is applicable to black bodies – grey ones at the least – but not necessarily to single molecules, such those in a gas, like CO2, that do not show a continuum of emission/absorption, but rather discrete fine lines (although many of them). Fluorescence is one example of an excitation at one wavelength, and emission (if at all) at a lower one. Why do you think is CO2 a perfect example for absorbing and – without any losses – emitting at the same wavelength? I think it is more correct to say that each level is essentially in local thermal equilibrium. CO2 radiation will also be in thermal equilibrium absorbing and and emitting equal amounts of radiation for those line wavelengths which remain opaque for that level. After this simple model I used the Hitran databse to derive effective emission heights for CO2 lines see: http://clivebest.com/blog/?p=4597 If I find time I want to also include H2O. Then no Kirchhoff, but LTE. This, you say, entails “absorbing and and emitting EQUAL amounts of radiation…”. I think – correct me if I am wrong – that the lifetime of the excited state of CO2 is in the order of millisecond, and the time between collisions in nanosecond for the lower atmosphere. This changes as you go up. Most of those collisions will result in non-radiative energy loss. But i think your approach requires exact equality for absorption and emission. So what are your assumptions to make absorptions and emission equal? All it is really saying is that the temperature of each layer in the atmosphere is defined by the environmental lapse rate. Radiation emitted by CO2 vibrational lines is equal to that which would be emitted by a black body in those same lines at the local temperature. Such a black body emits the same IR as it absorbs. This is only the case for an opaque atmosphere i.e. mean free path of CO2 photons < 100m. I also think that radiative transfer codes assume the same thing. Sure, lapse rate is just different word for temperature profile. But the remainder is circular reasoning: you say that CO2 emits radiation “as if it were a black body”. But continue to say “now that we have established that it is a black body, we conclude that it must absorb as much as it emits”. I am afraid, no. It isn’t a black body to begin with. This would be an assumption, which requires proof, and i don’t see any proof (neither here nor elsewhere, which is why I am asking. And I ask you because you seem to have a lot of knowledge on the matter ). And finally, assuming all this were the case, why should it have a limitation “free path of photons <100m"? It would be a weird black body. Ulrich, I agree . All models make some basic assumptions – for example a fixed temperature profile and LTE. They all assume that CO2 radiation is in thermal equilibrium when line photon mean free path is small compared to the temperature gradient. A proper integration is needed to account for photons escaping to space as the atmosphere thins. Eventually more heat is radiated out than is convected upwards in the higher troposphere. This defines the tropopause because convection runs out of steam and the lapse rate goes to zero. No one model describes things exactly. They are all wrong and even more so when they assume fixed H2o “feedbacks” ! Hi Clive, I think the lapse rate is determined by the adiabatic compression relationship; as long as the pressure is higher at lower altitudes the temperature must be higher. Put another way, you tell me the temperature conditions at sea level and top of a mountain and i can tell you the height of the mountain. This does not depend upon CO2 concentration. As I understand it, CO2 effects the altitude at which photons can escape to space, but not the temperature. Hence if the effective altitude of photon emission changes, the earth’s surface temperature is changed because the lapse rate is approximately constant. By the way, I much appreciate your efforts on this problem, and I hope you can helpl simplify what is going on to the point that we can get some physical insight on this. Yes that’s right the lapse rate depends mainly on adiabatic convection modified by water condensation (latent heat release). It has nothing to do with CO2. It is my impression that radiative transfer codes assume a constant lapse rate to derive the radiative forcing due to a doubling of CO2. They also assume local thermodynamic equilibrium at each level until photons from thermal CO2 start to escape to space. This determines an effective emission height which increases with CO2 concentration. This reduces the energy loss to space from CO2, but H2O and the IR window remain unchanged(it is assumed). If the lapse rate itself decreases in response to this forcing the this would act as a negative feedback. Then if I understand you correctly, the answer to your question (3) is “yes,” there is a lapse rate without greenhouse gas. I think (but am not sure) that the energy of most of the infrared photons that are absorbed by CO2 are collisionally dissipated in the simple model, so that the lapse rate is the same regardless of the CO2 concentration. Because the effective radiating level is at a higher altitude, and the earth is obliged to radiate the same amount of thermal energy, the temperature must increase at the new effective radiating level, and thus also at the surface. .
To maintain the lapse rate you need some energy to escape to space. H2O alone would be enough to ensure the lapse rate would be self sustaining. If you had a pure nitrogen atmosphere then I think the tropopause would be much lower down as convection would be height limited. Even N2 would emit some IR to space through collisions. Your argument about a higher effective radiating level is correct. To balance energy the Earth needs to radiate the same amount of energy so the temperature increases all the way down the lapse – including the surface. Why exactly do you ‘need some energy to escape to space’? The lapse rate is calculated without any such reqirements. I initially thought that a perfectly still non-radiating atmosphere in a gravitational field sitting on a uniform “hot plate” surface at a fixed temperature would produce a dry adiabatic lapse rate for ever. However such an atmosphere would eventually reach thermodynamic equilibrium due to convection. To maintain a lapse rate you need heat flowing through the atmosphere. A convective atmosphere is never in thermodynamic equilibrium and acts more like a heat engine driven by solar energy. Gravity is essential for the lapse rate because it compresses the atmosphere resulting in a hydrostatic pressure gradient. In bulk thermodynamic terms – air that rises up against gravity looses energy by doing work and air that falls gains energy by having work done on it. However Entropy must always increase in any heat engine. The clumping of molecules near the Earth’s surface means we know more precisely their position. However if as a result of this they are heated then we know less about their velocities. Considering just the molecules it would appear that gravity decreases entropy. However as far as total entropy goes we need to include the whole universe for the second law and we have forgotten about radiation losses which must then lead to a net overall increase in entropy. This is why the sun and even black holes must eventually evaporate and die. I hesitate to question you on this since my physics is about 35 years out of date…but I think that a transparent atmosphere would still have a lapse rate in the steady state. Just as a high pressure condition can not last long at high altitude, high temperature molecules up high would diffuse and their energy would rapidly disperse to the steady state condition. Heat is radiated from whatever molecules have high emissivity, and collisional processes ensure that the temperature distribution stays close to the textbook case. Molecular velocity falls out of the E = 3/2 kT relation = 1/2 m v^2 . As a thought experiment, if some planet’s blackbody surface at T=Trad is emitting IR radiation through a transparent atmosphere, the lapse rate is still determined by the density gradient. If you then release CO2 so that the “average” leaving the atmosphere originates at some specific altitude H, Then T(H) must eventually become approximately equal to Trad. The temperature at the surface heats up to maintain the lapse rate relationship. As an aside, the earth is always being heated and cooled by the diurnal cycle. I’m not sure what happens to the local lapse rate in that condition, though I suppose on the average it has to be the same as steady state. I think Earth with say a 100% argon atmosphere would still have a lapse rate because of day/night north/south differential heating. However the surface would radiate directly to space and reach a mean temperature of around 5C (without clouds). The lapse rate temperature would then go down from this average surface temperature and the tropoapuse would be much lower than today. Your physics is fine and mine is also 30 years old ! you are not giving an answer to my question: at which point in the derivation of the formula for lapse rate is ‘heat flowing through the atmosphere’ or IR radiation needed? I don’t see any point. Your explanation is triple contradicting itself. The atmosphere is never ‘perfectly still’, there is always convection, and therefore indeed it is never in equilibrium. Pulling in arguments like ‘heat engine’ and ‘entropy’ and ‘black holes’ and quantum uncertainties about position and velocity don’t help answering the initial question (and I think they are completely irrelevant). Tell us where in the lapse rate calculation the error is, which can be resolved by introducing entropy and heat engine. A lapse rate will establish with or without greenhouse gases. You are correct – The formula for the Dry Adiabatic lapse rate (DALR) depends only on gravity and the specific heat of the gas. It does not depend on radiation. However the height of the tropopause does depend on radiation, because eventually radiative losses to space puts a limit on how high convection can reach. The slope of the lapse rate may be fixed but the surface temperature depends on how down the lapse rate goes from Teff. Venus has an opaque atmosphere with CO2, SO2, H2so4 etc. and the tropopause is 50 km above the surface. The surface temperature is much higher than Earth as a result. Okay, my physics was not that good even 30 years ago and I am barely following along so please forgive this question. Shouldn’t there separate models for day, night, and maybe a couple maybe a couple in between if we are modeling a vertical column in the atmosphere? If this is already the case then does CO2 trap heat in day as it does at night with the same efficiency? Do the models adjust for the diurnal imbalances in-out radiation? And, as you pointed out energy is getting dispersed in all directions once it hits Earth, especially to the colder poles, by both radiation and convection. Is this accounted for? Thanks so much! I understand your purpose is to model the greenhouse effect of CO2 alone and to do so simply. An admirable goal. I just have a feeling something is not quite right in your model. I am, like some other commenters, troubled by the assumption that kinetic/convection heat transfer within and between layers does not appear to be accounted for. That is, each layer has a heat capacity dependent on its composition. The differences in CO2 levels you use likely would not alter heat capacity much. Still, at different CO2 concentrations, each 100-m layer would have different equilibrium temperatures, which would then feed back on water content, pressure, etc. Now you may have accounted for this and I am just not understanding, but that then leaves one with what seems to me an important question, what about the ground? You assume a 288 degree K ground surface. The ground surface interacts thermally with the atmosphere, and has a heat capacity. So, if you are trying to ascertain the temperature changes in the atmosphere that interacts with a ground surface, and that surface is the, or at least a major, outgoing IR radiation source, and convection and (back)radiation heated by the overlying air, then to provide an estimate of the heating effect of different CO2 levels, should the model not also bring the surface to thermal equilibrium with the CO2-determined air temperature? Put another way, more CO2 raises the temperature of the bottom of the atmosphere, which should then raise the temperature of the BB ground surface. Would that alter the implied CO2 heating effect? The kinetic energy and convection heat transfer are kind of implicitly included through assuming a fixed lapse rate. The assumption is that the atmosphere remains in equilibrium via the adiabatic lapse rate. Gravity ensures that pressure falls off exponentially with height and buoyancy ensures that the lapse rate is maintained at -g/Cp up to the tropopause (-6.5C/km with moisture). All that is really being modelled is the radiative transfer due only to CO2 molecules through the layers. If somehow you could switch off convection and radiation was the only way to cool the surface, then the lapse rate would be much steeper and the surface much warmer. In a sense convection and evaporation short circuit radiative transfer to move heat up through the atmosphere to where it can radiate freely to space. I think a better derivation of the greenhouse effect is given by calculating this effective radiation level. I forgot to add that your criticism about the surface fixed at 288K is of course correct, and in reality any surface warming would increase radiatiove flux as DS ~ T^3 DT. This model really just looks at how the profile changes under an instantaneous change in CO2 levels at fixerd surface temperature. The model is simply a flat infinite surface with T = 288K.